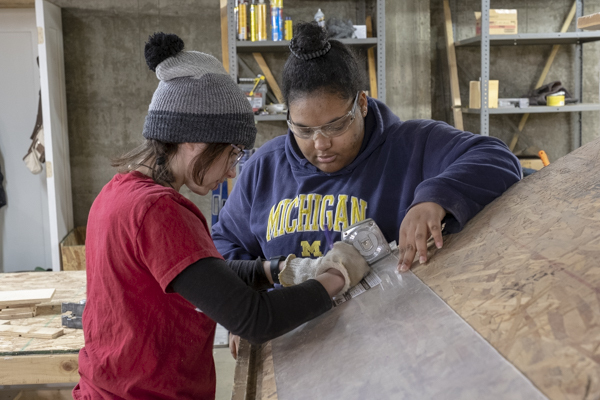 Genesee County Habitat for Humanity was one of eleven volunteer locations for UM-Flint's 'day of service' honoring Dr. Martin Luther King, Jr.
Vorice Patterson spent part of Monday, January 21, cleaning beds and rooms at Carriage Town Ministries. 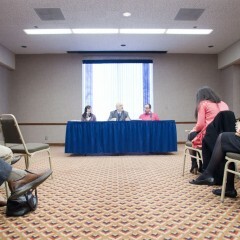 The UM-Flint sophomore met other volunteers from the university, and elsewhere. And the work sparked ideas for her about how to contribute to the community throughout her college career. “It’s important to be a source of light in the community, and show people we have hope here,” said Patterson, a health sciences major. Environmental and social justice activist Siwatu-Salama Ra, the university’s keynote speaker for MLK Day 2019, said it was critical to bring about systematic change through organizing and protest and other forms of activism, but also through love. “We wage love. Because love wins,” she said. UM-Flint students, staff, alumni, and faculty worked with numerous community groups, including Crossover Downtown Outreach Ministry, Habitat for Humanity, Joy Tabernacle, My Brother’s Keeper, Sylvester Broom Empowerment Village, United Way of Genesee County, Carriage Town Ministries, Center for Hope, the North End Soup Kitchen, the Franklin Avenue Mission, and Ele’s Place. 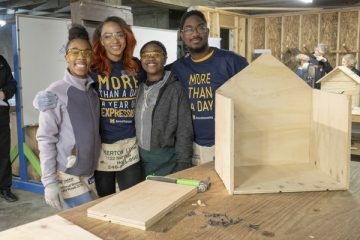 UM-Flint students built “little libraries” at Genesee County Habitat for Humanity on MLK Day 2019. Brown, along with fellow UM-Flint Block Club leaders Lena Miles and Terrell Harris, spent part of Monday dicing up pineapple for the soup kitchen. Miles said the day of service allows people to feel part of a larger community and create a sense of belonging. 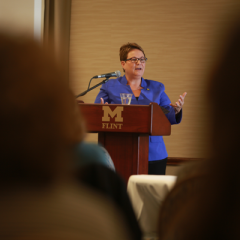 And it also may spur community members to feel more comfortable coming to events on campus throughout the year, Harris said. Miles echoed the thoughts of organizers and other volunteers who said the day helped introduce new relationships and served as an impetus for creating lasting community connections.